I can’t read, haven’t learned how to write, my whole life has been one big fight. Born under a bad sign. I been down since I begin to crawl. If it wasn’t for bad luck, I wouldn’t have no luck at all. I ain’t lyin’, ff it wasn’t for bad luck I wouldn’t have no kind-a luck – if it wasn’t for real bad luck, I wouldn’t have no luck at all. These amazing lyrics by William Bell and Booker T. Jones, both working for Memphis based Stx records were written for Albert King, who recorded Born Under A Bad Sign in 1967. Since then, this song has been covered by everyone from Cream to the most rough-and-tumble Delta bluesmen. I heard it again a couple of weeks ago when I was in Chicago to hear the incomparable Guitar Shorty, sing it as part of his session at Buddy Guys. Guitar Shorty is a good friend, and one of the all-time great guitar players. Unfortunately, just a couple of months ago, this 81year old blues legend was robbed following a show in California. The bandits made off with his tour van and nearly $30,000 worth of equipment. Even after having performed and delighted music lovers for over 50-years, Shorty did not have enough savings to replace the van and equipment and friends, including the likes of Elvin Bishop and Walter Trout, have been donating to try and help him. A gofundme page has been set up (https://www.gofundme.com/23swg7g6), and I personally ask you to take a look at it an consider donating if you are a lover of music or a fan of the blues. The tragedy that befell my friend got me thinking about the nature of crime in America. The recent attacks on police, the call by Republican presidential candidate Donald Trump for more law and order in the country, and recent attacks on young female jobbers in both New York and Boston seem to suggest that crime is surging. This is likely not true. 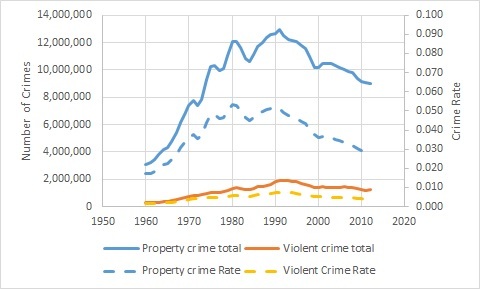 Even though crime statistics are notoriously poor, the fact is that, according to the Bureau of Justice Statistics, crime peaked back in 1990 or 1991 and has been steadily falling since. In 2012 (the last year for which data are available) crime was down by 31 percent since its peak, and – since the population has increased – the potential of being a victim of a major crime was down 45 percent. While this is good news, it does not account for the fact that everyone who is impacted by crime experiences tremendous difficulties. Guitar Shorty, and the five members of his band, cannot perform or earn a living, the families of the joggers that were killed lost their daughters, employers lost employees, partners lost their best friend. These are tremendous impacts that cannot be explained by statistics. And even with the reductions, Americans still face a 3.3 percent chance of being a victim of a major crime each and every year. This is a big number. Think of it, if the average person is connected to say 10 people, this means that each and every one of us has a one in 3 chance of being involved in or being close to someone involved in a crime every year. Since crime is concentrated in certain communities, the likelihood will be much higher for certain Americans. So in spite of the good statistical news, crime in America is still 36 percent higher than when I was born, and still directly impacts about 10 million people each year. The country was not Born under a bad sign and all Americans need to understand that crime is still a major problem in our communities. Its impact is broad, and it is cruel and we all need to work to reduce crime and its effect on our neighbors.